Sandy Garbrandt captured the spirit of the holiday season in her new ornaments designed for Janlynn. 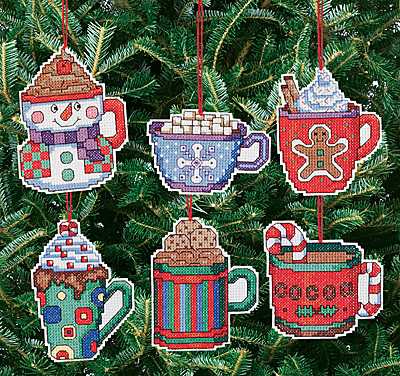 This set of 6 Christmas cocoa mugs are approximately 3.5” when finished, and would look lovely hung on a Christmas tree or tied to the top of a package as an accent. Whether you keep them for yourself or give them to a friend, one thing’s for sure - these ornaments will be cherished for many Christmases to come! Contains: 100% cotton 14-count White Aida 15"x18", White Felt 12"x8", 1 card of 100% cotton 6-strand floss, needle, graph & multi-lingual instructions. Made in the USA for Janlynn, a family-owned business unleashing creativity since 1979. Sandy Garbrandt.